Over the course of the past 14 years, our family has spent an average of $250 per month on groceries and household items for the four of us. At the request of a good friend, we’ve decided to share our weekly menus with the world, in hopes that you too can get your family out of debt in this gloomy economy. Our weekly menus run from Monday through Sunday. Week 1 Grocery Notes: If you’ll note in the picture, I purchased 30 pounds of pork in various cuts from Food Lion for $29. The Welches juices were completely free due to coupons I received from posts shared in the freebies forums. The vegetables were purchased at our local store for under $6 total. (Please note that there are 2 packages of dole salad mix that got cut off from the photo). 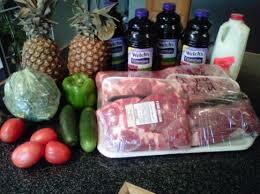 Total cost for the groceries pictured here $38.62, (including tax). Obviously we aren’t going to eat all of that pork in a week, it will most likely be spread out throughout the entire month. The 1/2 gallon of milk isn’t going to last the entire week with 2 teenage boys to feed, but we already had a gallon on hand before this shopping trip. The additional $11.38 was spent on weekly loss leaders. I raise chickens & therefore have more eggs than you could shake a stick at! The chickens are free range (most of the time) and eat whatever they can find, plus all of our fruit, veggie, grain/bread table scraps. In addition to providing us with 3-4 dozen fresh eggs per Week, they also provide an excellent fertilizer for the lawn/garden, as well as pest control. If you have the opportunity, it is well worth getting 3-4 hens to provide nearly free eggs. *Several of the vegetables listed were purchased (or homegrown) when they were in season, vacuum sealed and frozen. We do our best to purchase fruits & vegetables in season and either can, freeze or dehydrate them for later consumption. I was looking for the post about the $10.00 one. I found this one so I’m going to try and see If I can do the same thing. Might even give me something to start on for the new year. Thank you for all that you do. So the lunches during the week, they would not fill my kids at all. Are the kids included on the count in the menu? I mean just one of my children for lunch will take two sandwiches, apple, cookies, cheezits, granola bar, and a drink and still be starved when they get home. And I have three teenage boys who eat like that. And on the weekends you can add three more teenagers that also eat like that. I am glad you have posted this, but after weeks of looking at it, I cannot figure out how to make it work for my family in Michigan where animals are not allowed to be kept on your property where I live, and gardening is only good for like 3 months. I have gotten some ideas though, so thank you. So the lunches during the week, they would not fill my kids at all. Are the kids included on the count in the menu? I mean just one of my children for lunch will take two sandwiches, apple, cookies, cheezits, granola bar, and a drink and still be starved when they get home. Yup, ours too, they eat like ravenous wolves, if I have grilled cheese on the menu plan, my oldest can eat 4 without blinking. I always include salad, it’s filling, it’s healthy and it’s cheap. I make homemade croutons, bake bacon slices and finely chop them to add to salads, add hardboiled eggs, etc. It doesn’t take long to take a boring salad and make it filling and tasty.I’ve found when they get junk- cheez-its, crackers, granola bars etc they become unending pits of hunger. Salads where cheap when I lived down south, but a bit more expensive up here in MI. It helps that I make my own granola bars and can alot of stuff. Fantastic web site. I just finished reading all of our article, and am now going through your weekly menus. I have to say THANK YOU. Yes, I used all capital letters but because your web site is so relevant and helpful. I wish I would have found this site earlier, thank you for all the great advice on how to eat on a budget and not feel like it.